What is the difference between a concept and a skill? A skill is the ability to perform a task. Concepts provide the understanding of "why" we do the task. For example, the individual can learn to load the dishwasher, but does s/he understand why s/he is doing it? Does the learner have an understanding that only dirty dishes go in the dishwasher? How do we know if dishes are dirty? What is clean? Why is it important to know the difference? Learning concepts, not just skills, helps the learner with deafblindness make sense of all parts of life. 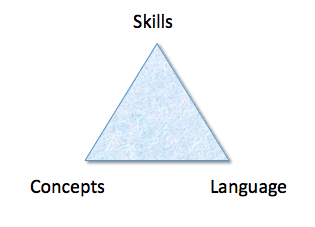 Skills relate to abilities, while concepts relate to understanding what you are doing and why. We once designed a wonderful routine for a student in a middle school, Nicole. She was totally blind, had moderate hearing loss, stood and walked with some assistance, had good receptive understanding of object cues and some understanding of tactile sign, and her formal expressive communication with object cues was just beginning. The routine was cleaning test tubes and beakers for science in her classroom. We were very proud of it. It was excellent, but a member of staff pointed out one large and terrible problem: NICOLE HAD NO IDEA WHAT IT WAS ALL ABOUT! The routine did not make sense to Nicole. Nicole was pushed through a series of skills with the beakers, but lacked a conceptual understanding of what she was doing and why. What was Nicole's motivation to do this activity? The routine was not meaningful for Nicole. Motivation: When something makes sense, it is more motivating because the learner knows why s/he is doing the activity. Being a participant in life is intrinsically motivating. There is satisfaction in being actively engaged in life. Problem Solving: When something makes sense, the learner is able to solve issues that may arise. Transference and Generalization: When the learner understands the concept of an activity, s/he can quickly adjust to new situations. Participate in whole cycles of activities. When does laundry really make sense? It makes sense when you have got your own shirt unmistakably dirty, identified it as dirty, taken it off, washed and dried it, identified it as clean, and put it on again. It is important for the learner with deafblindness to be given opportunities to participate in the whole cycle of laundry. Base curriculum activities that "Make Sense" to the learner. The learner is most motivated to learn in activities that are meaningful to him/her. Analyze the concepts as well as the skills in activities. Attach language to all participation. All concepts are carried by language. Use a Total Communication Approach. Model the language that goes with the concept even if the learner does not know the word. A sighted, hearing learner hears words hundreds of times before s/he attaches meaning to them. A learner with deafblindness needs the same opportunity and exposure to language before it becomes meaningful. The difference is that the learner with deafblindness may need thousands (or more) of repetitions to make the same associations between the word and the action or concept it represents. Use teachable moments. A moment when the learner is fully interested in something is a moment when concepts can sink in. Always be on the lookout for those moments and give them language. Use the Total Communication Approach. Use body language, facial expressions, touch, objects, sign, voice, pictures, photos, or line drawings to help your learner understand. Remember, the learner may get partial information from several of the modes. The Intervenor often uses a combination of communication modes to help the learner understand. Generalize concepts to many situations. Start with concrete, functional concepts (eat, ball, stand) before abstract concepts (red, three, yes). It is easier to learn the labels for an action or an object and the functional use of an object, than it is to learn more abstract concepts, because the learner can actually touch the object and interact with it. Once the learner has the understanding that objects and actions have names, then it will be easier to learn more abstract concepts such as attributes (colour, shape, size), directions (up, down, here, there), positions (over, under, in, out), emotions, time, and manners. For all activities, it's important to consider the skills and concepts required, as well as how you will provide the learner with language for them. Making sense of his world is particularly difficult for C. who is totally blind, profoundly deaf, and has a seizure disorder. We had a hard time developing educational routines for C. because his mom insisted that they must mean something to him. We tried to develop routines in recycling, vacuuming, and plant care. C. received a trained companion dog, named Bella, who was permitted to be at school with him. This gave us an idea for C. to make biscuits for Bella and feed one to her. Eventually, C. understood all the parts of the routine - the skills, concepts, and language. He understood mixing, baking, bagging, set-up and clean up. He understood "food for Bella." The team used the activity to work on all of his educational goals - fine and gross motor, communications, choosing, and social interaction - because the activity made sense to him. He understood the concepts. Skills are easy to measure because they relate to physical actions. How do we measure concept development? The individual with deafblindness is learning "wet" and "dry" as part of his job with plant watering. The concept can be learned as part of a real and purposeful task of caring for plants. He feels the soil and it is "wet." He gives the symbol for "wet" to his Intervenor, signs "wet," and does not water the plant. He feels the soil and it is "dry." He gives the symbol for "dry" to his Intervenor, signs "dry," and waters the plant. This is learning within a meaningful activity where the individual is learning by doing.